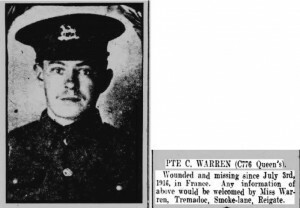 Charles John Warren was born either in the 2nd quarter of 1894 or on 23rd February 1894 at Holmwood or Dorking, Surrey to agricultural labourer Campbell Wilson Warren and Jane Warren nee Wilkins. Charles John´s father, Campbell Wilson Warren, was born on the 7th of November 1847 in Newdigate, Surrey to farmer John Warren, born about 1806 in Charlwood, Surrey and Caroline Warren nee Humphrey, born about 1815 in Newdigate, Surrey. 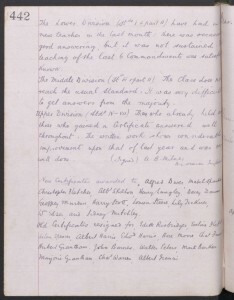 Campbell Wilson was baptised on the 26th of December 1847 in Newdigate. 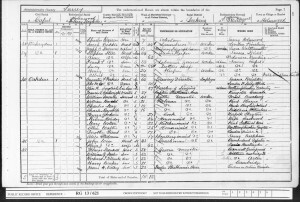 At the time of the 1851 Census, Campbell Wilson´s father, John Warren, a farmer of 216 acres, employed 5 men and a boy. The family also employed a house servant. Charles John´s mother Jane Wilkins was born about 1851 in Charlwood, Surrey to agricultural labourer Joseph Wilkins (born about 1827 in Charlwood) and Jane Wilkins (born about 1831 in Horley, Surrey). Jane was baptised on the 25th of May 1851 in Charlwood where the family lived at this time. Campbell Wilson Warren married Jane Wilkins by Banns on the 17th of April 1870 at St Nicholas church in Charlwood. At this time Campbell Wilson and Jane lived at Charlwood. 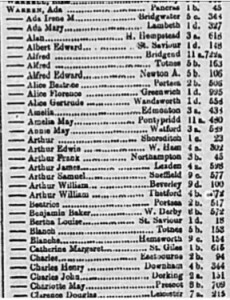 At the time of the 1871 Census, the family lived at Page Wood in Charlwood. Campbell Wilson was working as an agricultural labourer and Jane was looking after their daughter Harriett. At the time of the 1881 Census, the family lived at Scammells Farm Cottage in Dorking. Campbell Wilson was working as an agricultural labourer and Jane was looking after their children: Harriett, Joseph, Jane, Wilson, Annie/Ann and George. 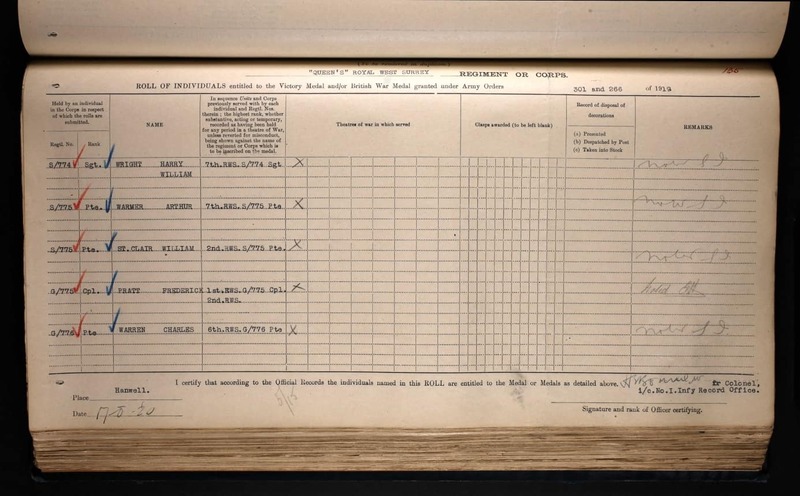 During the 1891 Census, the family lived at Scammells Farm in Dorking. Campbell Wilson was working as an agricultural labourer and Jane was looking after their children: Harriett, agricultural labourer Wilson, Annie/Ann, Edith, George, Kate, Margaret, Daisy and Harry. Charles John Warren was born either in the 2nd quarter of 1894 or on the 23rd February of 1894 in Holmwood or Dorking. He was baptised on the 8th of April 1894 at St John´s in North Holmwood, Surrey. Charles John had 11 blood siblings and possibly 1 half sister: Harriett Wilkins/Warren born in the 1st quarter of 1870 in Charlwood Surrey (possibly Charles John´s half sister), Joseph Warren born in the 4th quarter of 1871 in Charlwood Surrey (baptised on the 15th of October 1871 in Charlwood), Jane Warren born in the 4th quarter of 1873 in Charlwood Surrey (baptised on the 19th of October 1873 in Charlwood), Wilson Warren born on the 29th of March 1876 in Newdigate Surrey (baptised on the 4th of June 1876 in Newdigate), Annie/Ann Warren born in the 4th quarter of 1878 in Dorking Surrey (baptised on the 12th of January 1879 in North Holmwood), George Warren born in the 1st quarter of 1881 in Dorking or Holmwood Surrey (baptised on the 3rd of April 1881 in North Holmwood), Edith Warren born in the 2nd quarter of 1883 in Dorking Surrey (baptised on the 29th of April 1883 in North Holmwood), Kate Warren born in the 1st quarter of 1885 in Dorking Surrey (baptised on the 29th of March 1885 in North Holmwood), Margaret Warren born in the 1st quarter of 1887 in Dorking or Holmwood Surrey (baptised on the 13th of March 1887 in North Holmwood), Daisy Warren born in the 4th quarter of 1889 in Dorking Surrey (baptised on the 20th of October 1889 in North Holmwood), Harry Warren born in the 2nd quarter of 1891 in Dorking or Holmwood Surrey and Rose/Rosa Warren born in the 4th quarter in 1891 in Dorking or Holmwood Surrey. 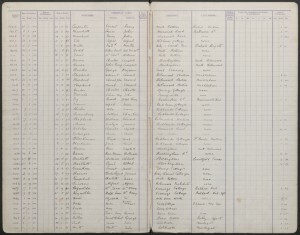 On the 30th of April 1900, Charles John enrolled into the South Holmwood Church of England School, having previously attended North Holmwood School. At this time the family lived at Stockrydons. 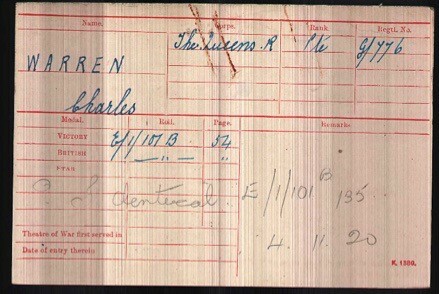 On the 6th of March 1903 Charles John received a new certificate for having passed an especially satisfactory examination for children of the upper group. On the 20th of October 1905 Charles John stopped attending the South Holmwood Church of England School, because he was admitted as a patient into London Hospital. 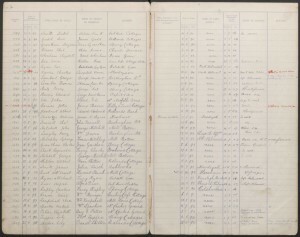 During the 1901 Census, the family lived at Stockrydons in Holmwood. Campbell Wilson was working as an agricultural labourer and his wife Jane as a laundress. The household also comprised of their children: ground labourer George, and scholars Margaret, Harry, Rose and Charles John. 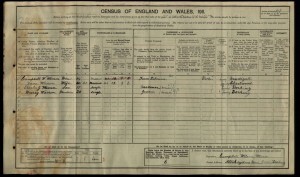 At the time of the 1911 Census, Charles John was still living with his parents at Stockrydons in Beare Green and was working as a gardener. The accommodation had 6 rooms. Charles John´s mother stated that during her marriage with Campbell Wilson Warren she had given birth to 12 children of whom 9 were still alive. 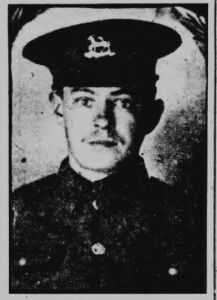 Charles John was part of the 6th Battalion the Queen´s Royal West Surrey Regiment. 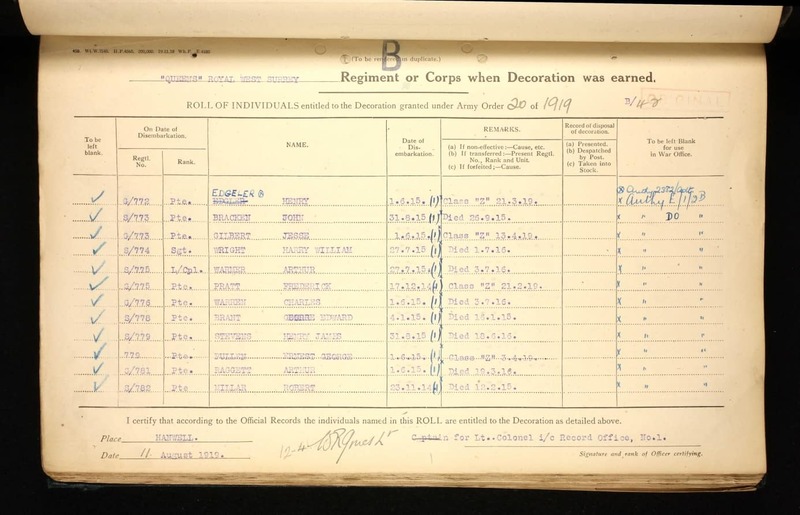 His regimental number was G/776 and he was a private. 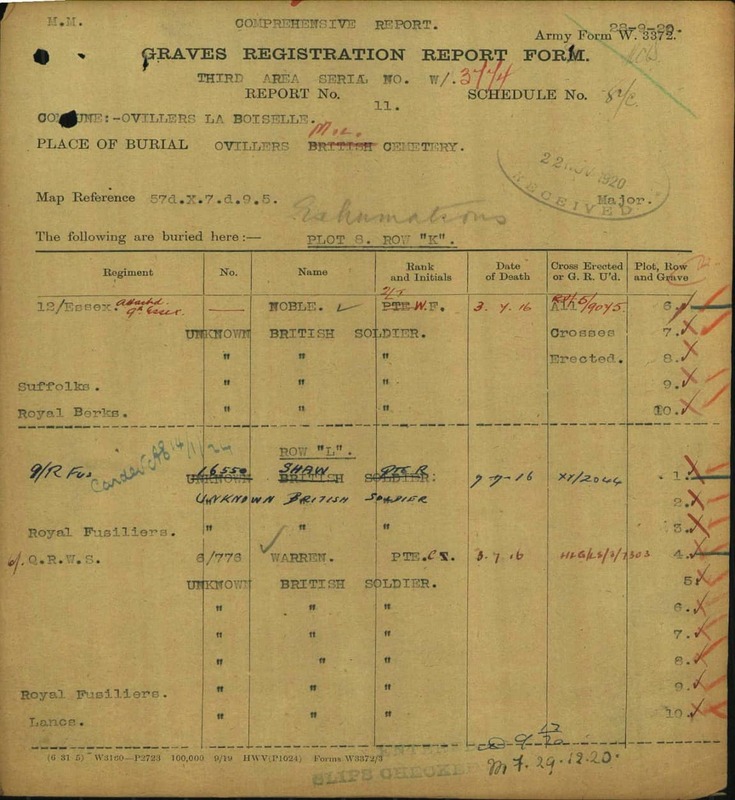 Charles enlisted at Guildford and at the time of enlistment was living in Capel. Charles disembarked to the Western Theatre of War on the 1st of June 1916 and was killed in action on the 3rd of July 1916 in France. He had first been reported wounded and missing before his body was identified. 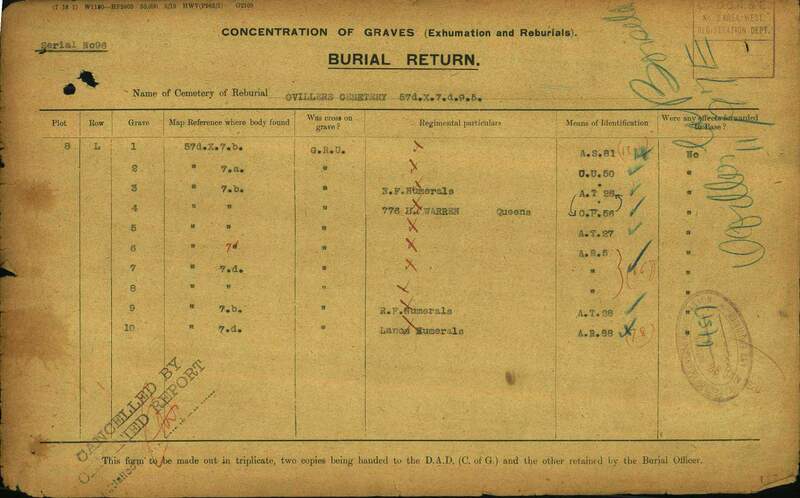 He was reburied into the Ovillers Military Cemetery in Somme, France. His grave reference is VIII.L.4. The headstone reads: ´In Loving Memory of our Dear One, Charlie´. 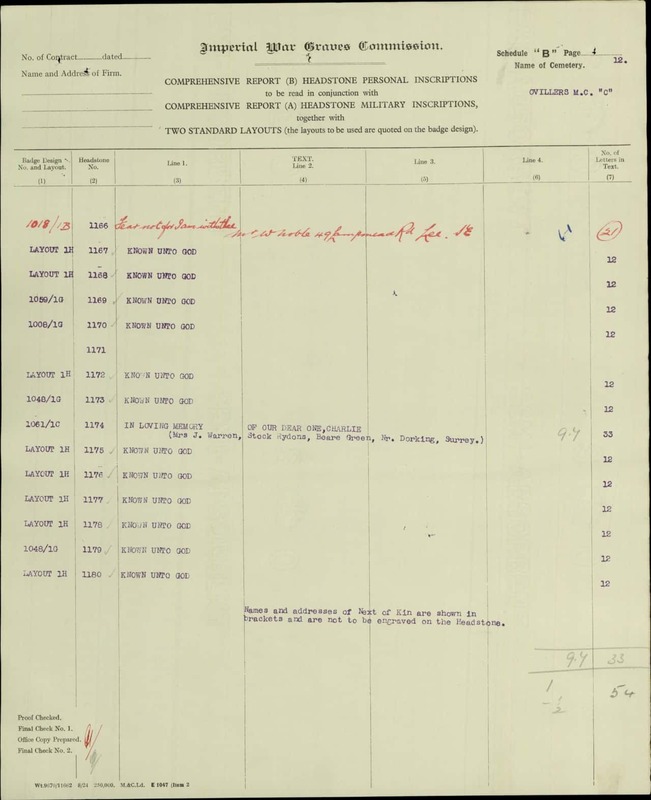 Charles John´s mother Jane Warren received £5, 7s and 8d on the 20th of December 1917 and further £8 and 10s in 1919 in Soldier´s Effect´s. After Charles John´s death his family still lived at Stockrydons in Beare Green. Charles John is commemorated at Oddfellows Hall in Dorking, Surrey as a member of the Loyal Holmwood Lodge. Charles John received the British and Victory Medals and the 1915 Star. Son of Campbell and Jane Warren of Stock Rydons, Beare Green, Dorking.